Hey, did you know I have an Apple Watch? Yeah, it’s true! And I kinda really like it. I mean, it’s no iPhone, but it’s pretty good, you know? I’ve been trying to find a way to talk about my Apple Watch experience and why I like it without repeating every other “I’ve had my Apple Watch for 11.5 days and here’s what I think” review. I’ve used it as a watch, as a messaging device and for exercise tracking. 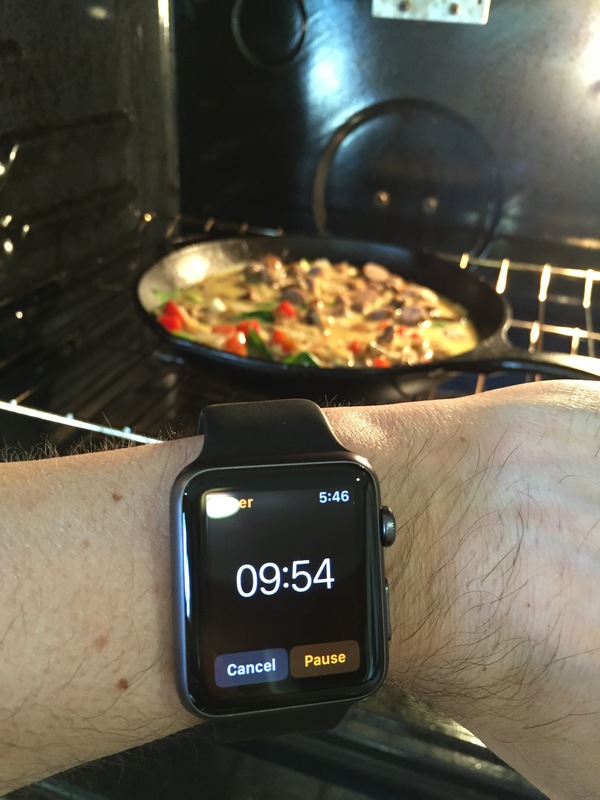 I really like all three use cases, but the thing that stands out to me is one I hadn’t considered: Using the Apple Watch in the kitchen. I’ve already found my iPhone and iPad to be incredibly useful while cooking as timers, for finding and reading recipes and for managing the shared Reminders grocery list my wife and I have. The only problem is, when your hands are covered in raw egg, pig parts or the contaminated bulgur that’s so popular these days, you don’t want to have to reach into your pocket and fumble around for an iPhone to set a timer or add something to the grocery list. It’s a little odd to call a watch “hands-free” but it is. Obviously, you need a wrist, but you don’t technically need hands. Goodbye, hand-based economy. And good riddance, I say. Unlike on the iPhone, Siri will just add whatever she thinks you said to the list without asking you to confirm it. [UPDATE: Thanks to Nick Heer, I tried this again on the phone and it seems she’s now stopped asking for confirmation. Up until recently, though, she had been and I’m really not sure what changed this behavior.] I’ve found this to almost always be better and wish iOS had an option to do the same. Only once have I ended up with something like “Mars tombs” instead of “mushrooms”. In that instance, I just tried again and it worked correctly the second time. Fortunately, the Safeway near our house doesn’t have Mars tombs. They sound expensive and I’d hate to have bought some by accident when we don’t really need any. The larger problem is Siri simply refusing to listen at all. Sometimes she just won’t respond and the screen goes dark as I vainly ask for her to add butter to the list. When this happens, I drop and raise my wrist to try again and it usually works. Before the update, I did have an instance where I had to restart the Watch to get Siri working again, as if she had gone on an extended coffee break. Setting a timer seems less prone to the problem of misinterpretation, which is probably not surprising since it’s a more easily defined set of instructions. Siri on the Watch seems to understand things just as well (or as poorly) as she does on iOS. If you have the timer complication added to your Watch face, you can see the progress every time you raise your wrist, which is pretty crucial for cooking. When the timer is done and the fries are up, you still have to use a hand to dismiss it, but a knuckle will work if you’re still rendering meats. 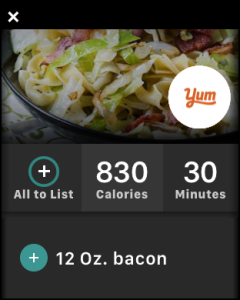 I use Yummly as a recipe discovery tool and they already have an Apple Watch app. Which maybe they shouldn’t as it’s a bit buggy. 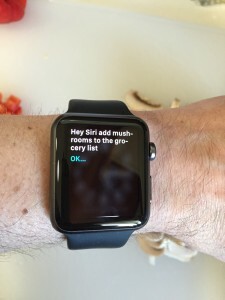 They should really forgo the recipe images on the Watch as they slow the app down noticeably. But the app will show you the ingredients of the recipes you’ve, ugh, “Yummed” in their system. As I’ve indicated, I use a Reminders-based list for grocery shopping, so I haven’t had occasion to use that feature yet, but I can see how it might come in handy. 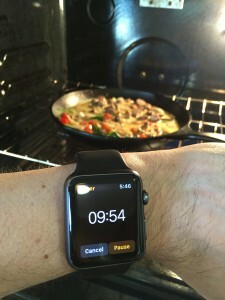 The utility of the Apple Watch in the kitchen probably shouldn’t have been surprising if I had thought about it, but it has turned out to be one of my favorite use cases.